In a historic achievement, nine civil servants from Nepal have conquered the world�s tallest Mount Everest on Wednesday. 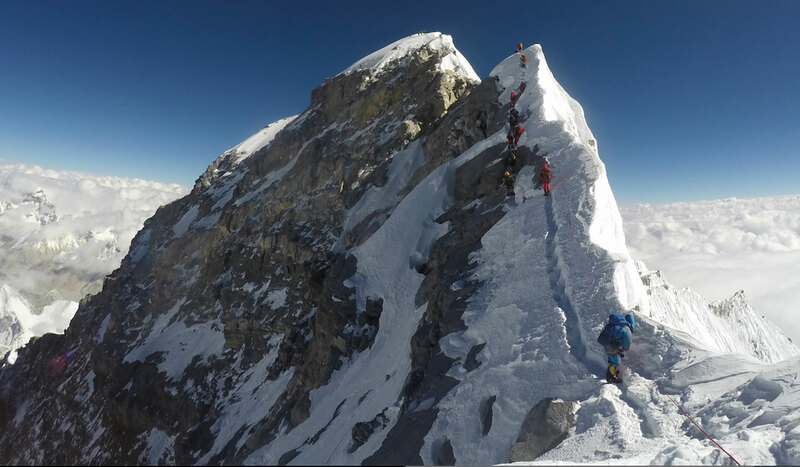 The all-civil-servant Mt Everest expedition team put the Nepali national flag and a flag of Nepal Tourism Year as they reached the summit of 8,848 meter tall peak. This is the first time civil servants from Nepal have conquered the Mount Everest. According to Tourism Ministry officials, the civil servant expedition team was divided into two groups. While a group of five members and five support staff first reached the top at 5:45 am four other members and 10 support staff followed them an hour later. Those making it to the top of the Mount Everest on Wednesday include computer engineer at the Tourism Ministry Santa Kumar Maharjan, surveyor at the National Land Use Project Khim Lal Gautam, non-gazetted first class officer at the Ministry of Information and Communications Tulsi Ram Bhandari, non-gazetted second class officer at the Ministry of General Administration Subir Shrestha and non-gazetted second class officer at the Tourism Ministry Hari Dhakal summitted in the first lot. Likewise, section officer at the Ministry of General Administration Surath Pokharel, section officer at the Ministry of General Administration Hari Prasad Guragain, non-gazetted first class office at the Tourism Ministry Gyanendra Kumar Shrestha and computer operator at the Ministry of Education Padam Bahadur Bhandari reached the top later. Altogether 15 civil servants had left for Everest Base Camp early last month with an ambitious goal to reach to the top of the Everest. While five members abandoned the plan due to illness team leader Lila Mani Poudel had returned to Kathmandu on Sunday after being recalled by the government following his appointment as home secretary. The government had earmarked NRS 3 crore for the expedition and waived the fee for the climbing permit. It is expected that the civil-servant Mount Everest expedition will also help to promote adventure tourism in the country. Nepal is currently celebrating Visit Nepal Year 2011 with an objective to bring in more than 1 million tourists in the country.